Aden (Agenzia Fides) - "We have no further news, and today, with technical means available, everything is possible in this field. But the photo may be authentic. There are those who, however believe that father Tom is still alive. And I also think he is alive". This is how Bishop Paul Hinder OFMCap, Apostolic Vicar of Southern Arabia, comments the publication of the photo which appeared on Father Tom Uzhunnalil’s facebook account, the Indian priest who was kidnapped on March 4 in Aden by terrorist commandos who stormed in a nursing home, slaughtering four Missionaries of Charity, along with 12 other people. The photo, which appeared on father Tom’s facebook account yesterday, portrays a painful-looking man, with longish hair, a beard and his hands on his chest. 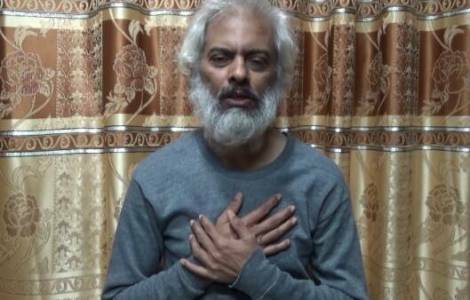 The English message accompanying the photo announces the imminent publication of a "plea" of the kidnapped priest. There is no indication who "posted" the photo and message. Many of Father Tom’s family members, have, under the unkempt beard and unusual long hair, recognized in the man in the photo the physical features of the priest. "For now" reports Bishop Hinder to Agenzia Fides "there are no further elements to decipher the meaning and origin of that photo".